Jessica McDonald scored in the 70th minute to earn the North Carolina Courage a 1-0 victory over Seattle Reign FC on Wednesday night at Sahlen’s Stadium at WakeMed Soccer Park in Cary, North Carolina. The Courage now extend their winning streak in 2018 to four games and hold on to the top spot in the league standings with a perfect 4-0-0 record. The Reign suffered their first loss of the season and are 2-1-0. This midweek match put the league’s top two teams head-to-head, with the Courage in the No. 1 spot after three weeks and the Reign at No. 2. Both sides entered Week 4 after a quick turnaround from Week 3 action where the Courage earned a road win on Saturday beating the Washington Spirit 4-2 and the Reign defeating Sky Blue FC 1-0 on Sunday. The Courage saw the better end in Week 4 thanks to McDonald’s finish in the 70th minute. McDonald now has 37 NWSL career goals and this was her second of the season. Her goal came from a perfectly weighted through ball from forward Kristen Hamilton. McDonald, who saw a chance like this just minutes before, was able to bury it this go around with her right foot. The Reign were without Megan Rapinoe on the night due to a left hamstring injury she suffered against Sky Blue FC over the weekend. 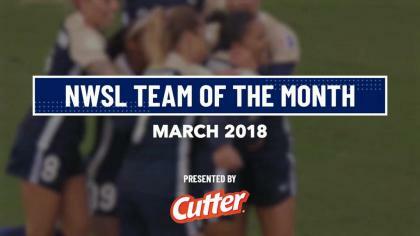 The March NWSL Player of the Month has been the difference maker for Seattle on the year earning two goals and picking up the Week 1 Player of the Week nod. The Courage on the other hand, were well suited on the night with Crystal Dunn, McDonald, Lynn Williams and Week 3 Player of the Week, McCall Zerboni all starting in the match. Courage midfielder Sam Mewis made her 2018 NWSL debut in the 78th minute subbing in for Hamilton. Mewis has been out all season with a right knee strain. Defender Kaleigh Kurtz was thrown into the mix in her NWSL debut starting at center back, usually where defender Abby Dahlkemper plays alongside Abby Erceg. Dahlkemper was not on the roster for the game, ending her streak of consecutive minutes played at 5,850, an NWSL record. The first half saw both sides battling for the go-ahead goal. The game was scrappy with the first chance for the Courage coming in the sixth minute after Hamilton drew a foul a few yards outside of the box. Jaelene Hinkle and Zerboni lined up to take the free kick, but rather than striking it like Zerboni did in Week 3 (in her brace against the Spirit) she chipped it looking for a onside McDonald. Seattle’s earliest chance came minutes later when forward Beverly Yanez got a good look on goal and was able to strike it with her root foot towards the right corner, however Courage goalkeeper Sabrina D’Angelo made the stop. D’Angelo finished the match with one save and now has three shutouts on the year. Reign FC had a huge stop in the 18th minute by Kiersten Dallstream. Dallstream made a goal line clearance off of a North Carolina corner kick. For the Courage it was hard to miss the work from Dunn on the right wing. Aside from getting four shots off (all on goal) she also was dangerous on all sides of the ball working back defensively helping defender Merritt Mathias handle the pressure of Reign forward Jodie Taylor and Dallstream down the flank. At the half it was scoreless, with neither side able to find the edge. While the Courage led in shots after the first 45, seven to the Reign’s three, Seattle held the advantage in possession with 56.9% to North Carolina’s 43.1%. The second half kicked off with what would be the story of Courage forward Lynn Williams‘ night. Williams had a chance in the 48th minute off of a through ball from McDonald. Williams picked up her head and looked to shoot left, but the shot went wide. The best spark of offense for Seattle came in the 67th minute when Jasmyne Spencer entered the game. Spencer came in and immediately put pressure on the Courage, seeing her first chance in the 69th minute off a cross from midfielder Allie Long. McDonald’s goal came a minute later and put her team up and in what would be control of the remainder of the match. In the 74th minute Williams had a chance to extend her team’s lead by two, but her shot went high. A minute later, Williams again has another look on goal after a Mathias crossinto the box. Williams got her right foot on it, but the strike was collected by Reign goalkeeper Michelle Betos. In the 78th minute, Williams had another chance. This time the play was started from Mewis, just moments after subbing into the game. Mewis played a wide open through ball to Williams during a fast break, but her right-footed shot was again collected. Williams finished the game with eight shots and two on goal. Darian Jenkins came into the match for McDonald in the 79th minute and had a chance to put her team up 2-0 when she dribbled with pace down the right flank and eventually cut in to dribble centrally where she got a shot off to the right corner. Betos once again came up with a big save for her side. Betos finished the match with four saves. Seattle had the edge on possession for the night at 55.3% to North Carolina’s 44.7%, the Reign also held a slightly higher passing accuracy with 72.9% to the Courage’s 70%. The Courage will have a short break before hosting Utah Royals FC on Saturday April, 21 while the Reign will get a breather before traveling to Orlando to face the Pride on Saturday, April 28. Match ends, North Carolina Courage 1, Seattle Reign 0. Second Half ends, North Carolina Courage 1, Seattle Reign 0. Corner, North Carolina Courage. Conceded by Michelle Betos. Attempt saved. Lynn Williams (North Carolina Courage) left footed shot from a difficult angle on the left is saved in the bottom left corner. Assisted by Crystal Dunn. Offside, North Carolina Courage. McCall Zerboni tries a through ball, but Denise O'Sullivan is caught offside. Attempt missed. Lynn Williams (North Carolina Courage) header from the centre of the box misses to the left. Assisted by Samantha Mewis. Attempt blocked. Crystal Dunn (North Carolina Courage) right footed shot from the centre of the box is blocked. Assisted by Jaelene Hinkle. Attempt missed. Jaelene Hinkle (North Carolina Courage) left footed shot from outside the box misses to the right. Assisted by Darian Jenkins. Attempt saved. 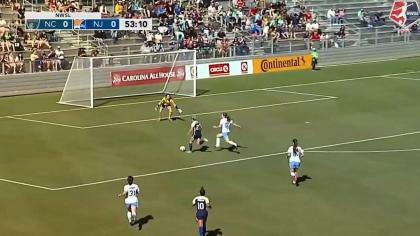 Darian Jenkins (North Carolina Courage) right footed shot from the centre of the box is saved in the bottom right corner. Assisted by Jaelene Hinkle. Attempt missed. Darian Jenkins (North Carolina Courage) left footed shot from the centre of the box is just a bit too high. Assisted by Denise O'Sullivan following a fast break. Foul by Elizabeth Addo (Seattle Reign). Attempt blocked. Crystal Dunn (North Carolina Courage) right footed shot from the left side of the box is blocked. Assisted by Darian Jenkins. Attempt missed. Samantha Mewis (North Carolina Courage) left footed shot from outside the box misses to the left. Lynn Williams (North Carolina Courage) hits the left post with a right footed shot from the centre of the box. Assisted by Samantha Mewis with a through ball following a fast break. Foul by Jasmyne Spencer (Seattle Reign). Attempt saved. Lynn Williams (North Carolina Courage) right footed shot from the left side of the box is saved in the centre of the goal. Assisted by Merritt Mathias with a cross. Attempt missed. Lynn Williams (North Carolina Courage) right footed shot from the centre of the box is just a bit too high. Assisted by Jessica McDonald with a cross. Substitution, North Carolina Courage. Samantha Mewis replaces Kristen Hamilton. Substitution, Seattle Reign. Elizabeth Addo replaces Morgan Andrews. Goal! North Carolina Courage 1, Seattle Reign 0. Jessica McDonald (North Carolina Courage) right footed shot from the centre of the box to the bottom right corner. Assisted by Kristen Hamilton with a through ball. Attempt missed. Jasmyne Spencer (Seattle Reign) right footed shot from the centre of the box is too high. Assisted by Allie Long with a cross. Substitution, Seattle Reign. Jasmyne Spencer replaces Kiersten Dallstream. Foul by Kiersten Dallstream (Seattle Reign). Attempt saved. Jessica McDonald (North Carolina Courage) right footed shot from the centre of the box is saved in the bottom left corner. Offside, North Carolina Courage. McCall Zerboni tries a through ball, but Jessica McDonald is caught offside. Attempt blocked. Lynn Williams (North Carolina Courage) header from the centre of the box is blocked. Assisted by Abby Erceg with a headed pass. Corner, North Carolina Courage. Conceded by Jessica Fishlock. Offside, North Carolina Courage. Kaleigh Kurtz tries a through ball, but Jessica McDonald is caught offside. Corner, North Carolina Courage. Conceded by Lauren Barnes. Offside, Seattle Reign. Beverly Yanez tries a through ball, but Jodie Taylor is caught offside. Attempt blocked. Morgan Andrews (Seattle Reign) right footed shot from the centre of the box is blocked. Assisted by Kiersten Dallstream with a headed pass. Jodie Taylor (Seattle Reign) wins a free kick in the attacking half. Attempt missed. Lynn Williams (North Carolina Courage) left footed shot from the centre of the box is close, but misses to the left. Assisted by Jessica McDonald with a through ball. Second Half begins North Carolina Courage 0, Seattle Reign 0. First Half ends, North Carolina Courage 0, Seattle Reign 0. Attempt missed. Lynn Williams (North Carolina Courage) right footed shot from outside the box is close, but misses to the right. Attempt missed. Merritt Mathias (North Carolina Courage) left footed shot from outside the box misses to the left. Assisted by Denise O'Sullivan. Attempt missed. Denise O'Sullivan (North Carolina Courage) right footed shot from outside the box misses to the right. Assisted by Crystal Dunn. Attempt missed. Morgan Andrews (Seattle Reign) header from the centre of the box misses to the right. Assisted by Lauren Barnes with a cross. Corner, Seattle Reign. Conceded by Abby Erceg. Attempt blocked. Jessica Fishlock (Seattle Reign) right footed shot from outside the box is blocked. Assisted by Kiersten Dallstream. Dangerous play by McCall Zerboni (North Carolina Courage). Offside, Seattle Reign. Yael Averbuch tries a through ball, but Jodie Taylor is caught offside. Offside, Seattle Reign. Jessica Fishlock tries a through ball, but Allie Long is caught offside. Attempt missed. Kaleigh Kurtz (North Carolina Courage) right footed shot from the left side of the box is close, but misses to the left. Assisted by Jaelene Hinkle with a cross following a corner. Corner, North Carolina Courage. Conceded by Yael Averbuch. Attempt blocked. Crystal Dunn (North Carolina Courage) right footed shot from the right side of the box is blocked. Substitution, Seattle Reign. Lauren Barnes replaces Christen Westphal because of an injury. Corner, North Carolina Courage. Conceded by Allie Long. Offside, Seattle Reign. Kiersten Dallstream tries a through ball, but Beverly Yanez is caught offside. Kristen Hamilton (North Carolina Courage) is shown the yellow card for a bad foul. Offside, Seattle Reign. Morgan Andrews tries a through ball, but Jodie Taylor is caught offside. Kaleigh Kurtz (North Carolina Courage) wins a free kick in the defensive half. Dangerous play by Kiersten Dallstream (Seattle Reign). Attempt saved. Beverly Yanez (Seattle Reign) right footed shot from the right side of the box is saved in the centre of the goal. Corner, North Carolina Courage. Conceded by Kiersten Dallstream.